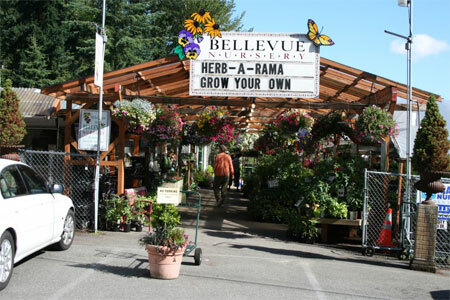 Bellevue Nursery has been part of the community for more than half a century, so our story is also the story of Bellevue, one of the fastest growing cities on the Eastside. Many of our customers still think of us fondly as the “Triangle Nursery”, since we sit on the triangular lot bounded by Bellevue Way SE, SE 10th St. and 104th Ave SE. Our actual street address is 842 104th Ave SE. Bellevue Nursery first opened as a Christmas tree lot because the building was not completed, but by the spring of 1955 it had become a full-scale nursery. The Mizokawa’s operated the nursery for 30 years, selling it in 1984 to Walt and Myrna Smith. Their son, Ken and his wife Lori, bought the business in 1989, and along with a dedicated team, worked hard to build on the quality of Bellevue Nursery’s service and products. When Ken retired in the summer of 2014, the Tian family (Edwin, Jessica and three young daughters) pledged their commitment to this neighborhood gathering place, continuing to provide you with quality products, superior service, advice and inspiration! Come visit us on the corner of Bellevue Way SE & SE 10th St! If you have any questions, please use our Ask Us Page to send us an email.